I love organizing. And I love tupperware. My mom knows this about me so she picked me up a set of Ikea’s Pruta storage containers. Love them. This is a set of seventeen and was only $4.99! Can you believe it? I heart Ikea….And I wish there was one closer to me. Anyway, the husband and I have been using these containers like crazy. The small ones are the perfect size for salad dressing, chopped up veggies, crackers, and fruit for our lunches. I’m obsessed. I love storage, too! These are too cute.. and only $4.99??? That's awesome! Ikea is exhausting to me though… and not exactly close. Oh, and Boyfriend needs more cabinent space. Ugh. Cabinent space. My entire apartment in Florence was decked out by ikea though, so we have a love affair. What a deal! 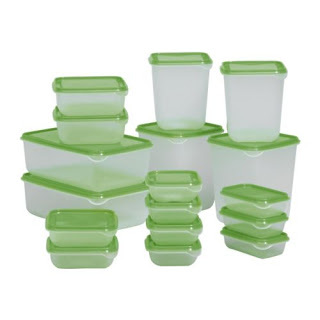 I just threw out our crap tupperware and bought some glass containers and a whole new set of plastic. It has changed my life. shut up!!! thats such a good deal!